Sometimes EP likes to work in Big Blue while it's parked in our driveway and turn it into her office for the day. And sometimes I get photos like this sent to my phone at work. For an indoor cat, Big Blue must be an awesome vacation. That picture right there is heaven on earth. 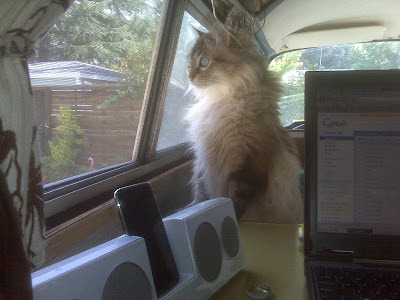 Working in a VW with wireless internet, an ipod and a cat. EP--I'm jealous. Cats in buses. I love it. That's one big thumbs up from me. Ha! Good memories there. Perhaps BV and I can strike a deal. New VW Bus=EP's office/Fuzz's playground. We determined some time ago that our next cat is going to be fully inured to camping in Ludwig. We saw one cat VW camper. A Vanagon that I walked once walked up on to check out and was greeted by a cat looking back at me. It always stuck me as the same type of cat that likes to go sailing.